“He says the equipment is only allowed for children,” the translator explains as an unimpressed museum minder glances at me. We are at the Onomatopoeia Rooftop of the spanking new TAD: Toyama Prefectural Museum of Art and Design, where graphic designer Taku Satoh has erected various play equipment inspired by the imitation of sounds. I was at the foot of an avant-garde bouncy installation, shoes off and ready to fully immerse myself in this multi-sensory masterpiece. As if she read my mind, the translator continues: “Those adults are allowed on as they are the children’s parents to…you know, keep watch of them. You, on the other hand…” She trails off, flashing an apologetic smile. Aside from the stinging reminder of my adulthood, my time at Toyama, Nagano and Gifu prefectures in Japan proved to be an enlightening experience. While tourist hordes in popular areas like Tokyo leave no street unexplored, here are seven alternative places to visit from the three above-mentioned prefectures. When visiting Toyama Prefecture, chances are you’ll find yourself flying in from Haneda Airport before settling into the main city of Toyama. 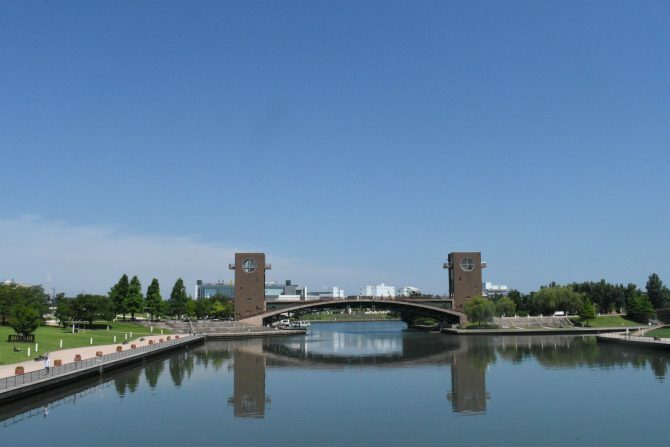 Quiet and serene, Toyama City is a complete opposite of bustling cities such as Tokyo. A prized gem of the sleepy city is the Fugan Canal Kansui Park, where the Tenmon-kyo Bridge stands stoic over peaceful waters of the canal. Boasting a view worthy of a desktop screensaver, the canal was initially constructed for flood control and now serves as a recreational area. Popular during the cherry blossom season, the green lawns near the canal are home to a Starbucks, which is described to be the most beautiful outlet in the world. Weekender would like to thank Japan Tourism Board for making this trip possible.